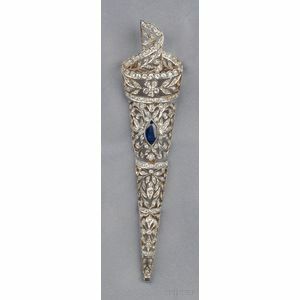 Diamond and Sapphire Pendant/Brooch, bezel-set with a marquise-cut sapphire further bead and bezel-set with single and old European-cut diamond melee, approx. total diamond wt. 3.65 cts, platinum-topped gold mount, lg. 5 in. Can be worn either as a brooch, as shown, or suspended from a cord trough the bail at the bottom as a pendant. Unobtruisve safety chain running through the length of the piece. Lively diamonds.